Machias, ME – In 2011, Wayne Rose, Operator and General Manager of two new and used car dealerships in Machias, Maine, decided to open a third business. With over 20 years of experience in the automotive industry, Rose became well in-tune with the needs of customers in his area. Being located in the Blueberry capital of the world and with a large farming and harvesting industry present, Rose saw a need for a tractor and farm equipment dealership and took it upon himself to establish one. With the needs of his customers in mind, Profile Tractor & Equipment was formed, in association with the Profile Group, supplying the Machias area with a vast array of tractors and implements. Once Profile Tractor & Equipment began to take shape, determining what equipment to carry was an easy decision for Rose. “My goal is always to provide customers with a product I believe in. After doing much research and comparing many brands, I found very few exceeding the quality and value of KIOTI. No other tractor line has better value per dollar,” says Rose. 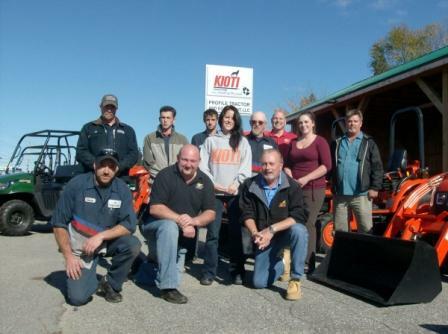 After seeing firsthand the benefits of KIOTI’s equipment, Rose took on the full KIOTI Tractor line, including UTV’s and implements, because he knew the equipment was exactly what his customers were looking for. Profile Tractor & Equipment has found a large customer base in the Machias area, from homeowners with yard work and landscaping projects, to contractors and small business owners with light commercial work, as well as farmers and blueberry harvesters working up to 1,000 acres of land. Contractors enjoy the CK30 Series for its durability and productivity on large jobs, whereas homeowners and hobby farmers prefer the CK20 and the CS2410 subcompact tractor models for their petite size and maneuverability. The wide range of customer needs in the local area has made a partnership with KIOTI Tractor the perfect match for Profile Tractor & Equipment, due to the vast capabilities and versatility of every piece of KIOTI equipment. According to Rose, customers find KIOTI tractors’ most appealing features to be their heavier-weight construction and solid steel components, both of which translate into durability in any application. Customers like being able to customize their tractor with KIOTI’s implements including a front end loader, mower, backhoe, snow blower or tiller, allowing them to do a variety of jobs with a single machine. Customers also find the hydraulic system desirable for smooth handling in rough conditions. In just shy of 2 years as a KIOTI dealership, Profile Tractor & Equipment has had early success with the KIOTI line. Since opening in 2011, KIOTI sales volume has been steady and continues to increase regularly. “Customers associate the KIOTI Tractor brand with quality,” states Rose. “They want a machine with great value that is affordable and built to last. KIOTI Tractor provides all three of these things. With KIOTI’s ‘second to none’ warranty, our customers leave here feeling confident with their purchase.” Rose anticipates that his customer base will expand rapidly over the next few years due to word-of-mouth from satisfied KIOTI customers. Profile Tractor & Equipment has been a KIOTI dealer since 2011 and offers the full line of KIOTI tractors, UTV’s and implements for homeowners, farmers, hobby farmers, landscapers and a variety of other end users. For more information on Profile Tractor & Equipment, Inc. or KIOTI tractors and UTV’s in stock, please call 207-255-4747.